One of the best ways to explore the scenic beauty that Monterey County has to offer is by hiking back roads, by-ways and trails. Pack a picnic, and point your compass in the direction of one of the many state and regional parks in the area. 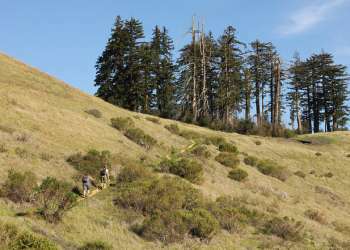 Plan a day trip to Jacks Peak in Monterey or Garland Park in Carmel Valley, and enjoy walking through dense forests, open meadows and traversing the Carmel River, or head out to Point Lobos State Reserve and choose a meandering trail along the coast. If you&apos;re planning an overnight camping trip, consider the Los Padres National Forest, easily reached from Big Sur. During the spring wildflower season, a wonderful world of flora and fauna awaits hikers who venture off the beaten path. Don&apos;t forget to bring along your copy of the latest National Audubon Society handbook so you can identify various birds. You may also meet up with deer, raccoons, foxes and coyotes. Keep your eyes open and you may see signs that wild pigs and even mountain lions have been in the area recently. Whether you&apos;re a seasoned hiker or are simply interested in taking a leisurely walk along the coastal Recreation Trail, there are plenty of places to wander. Remember to bring your camera, and don&apos;t forget to carry plenty of water. Happy trails!